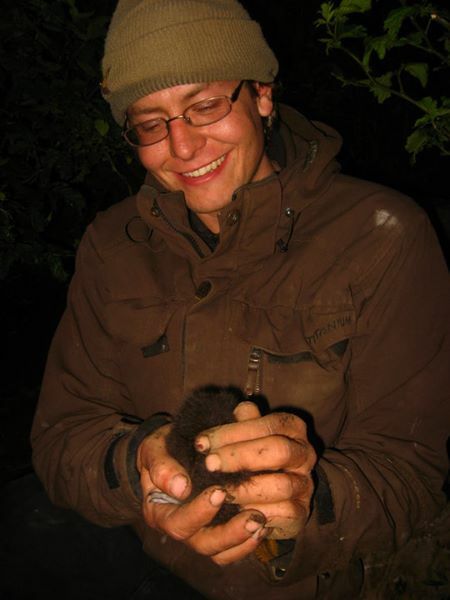 My first trip to Alaska was spent primarily on Middleton Island where I did a three month field biology internship with the USGS, monitoring sea-bird nesting. We worked with Black-legged Kittiwakes, Glaucous-Winged Gulls, Rhinoceros Auklets, Tufted Puffins and Pelagic Cormorants. Most of my time being spent with Kittiwakes, Glaucous-Winged Gulls and Rhinoceros Auklets (my favorite! ); the Rhinoceros Auklets do have small horns on their beaks like rhinoceros. There was also a little work done with Common Murres and song birds but for the most part I wasn’t involved. A lot of our work involved kid-napping baby birds or eggs and measuring them. There were also the nights spent waiting near Auklet colonies with hand nets. When the Auklets would land, moving towards their burrows with fish, we’d jump out and scoop them into our nets. We’d then take their fish away for analysis and band the bird. We only did this procedure rarely and spaced far apart, so as to make little impact on the birds health. Although this last procedure sounds mean, it was important not only for monitoring the health of seabirds but also of fish populations, which in turn could affect fishermen. Monitoring the size and species composition of fish in Auklet diet is a much easier and economic diagnostic tool than monitoring fish directly (although that’s done as well).